Was first 'Lost Colony' in Burke County? If Hernando de Soto and Juan Pardo had been successful and established a series of permanent settlements, we might all be speaking Spanish in this country rather than English. That’s one conclusion that archeologist Rob Beck of the University of Oklahoma likes to tell people about when he describes the discovery of Fort San Juan on the upper Catawba River in Burke County north of Morganton. That fort was established by de Soto’s men in 1567 – a couple of decades before Sir Walter Raleigh’s expedition set out from England and established a colony on Roanoke Island that disappeared – and became known as the Lost Colony. The Fort San Juan story is told in a new episode of UNC-TV’s “Exploring North Carolina” series produced by narrator Tom Earnhardt of Raleigh and videographer Joe Albea of Greenville. It airs tonight at 8:30 p.m. and repeats Friday, Feb. 1 at 9:30 p.m. and Sunday, Feb. 3 at 6 p.m. The program describes how Beck and other archeologists, including David Moore of Warren Wilson College near Asheville and Christopher Rodning of Tulane, assembled the evidence that linked the 12-acre site in Burke County to a known site at Parris Island. S.C., where Spanish explorers established a fort in what then was called northern Florida. From there the Spaniards set out to explore the interior, establishing forts near Indian villages. The hope was not just to convert natives to Catholicism, but also to build a road linking the East Coast with Mexico where the Spanish had opened silver mines. Evidently their belief was that the Blue Ridge Mountains were part of the same mountains they could see from Mexico – mistaking the Rockies for the Appalachian chain. The natives evidently tired of the Spaniards at Fort San Juan and burned down the fort after 18 months. For hundreds of years the exact locations of the forts the Spanish established has been unknown, but the researchers believe they have amassed enough compelling evidence – partly with the help of an obscure Spanish diary that had been in the N.C. Department of Archives and History for a long time – that they have found the first Lost Colony. Interesting that both the Spanish Lost Colony and the English Lost Colony were in North Carolina – putting this state, Dr. Beck said, at the epicenter of the Age of Discovery. A better way to nominate? U.S. Rep. David Price, D-N.C., thinks there’s a better way to select presidential candidates that the current wacky presidential primaries. In fact, according to The News & Observer, he thinks there are at least two better ways – one Democratic and one Republican. Price, who has represented the 4th District (including Chapel Hill, Durham and part of Raleigh for nearly two decades, things the compressed primary system leading up to the Feb. 5 “Super Duper” primary om 22 states, ends too abruptly, the N&O reports. He prefers a system that would have five primaries each Tuesday during a two or three-month period ending in March, reports correspondent Karin Dryhurst, with Iowa and New Hampshire leading off. As an alternative, the so-called “Delaware Plan” backed by some Republicans has merit. That plan would retain small state primaries at the start and save larger state primaries for later. He is not, however, enthusiastic about a single national primary because it wouldn’t test candidates sufficiently and would heighten the influence of big political donations, the N&O story said. Here’s a link to the News & Observer’s story. Thank you for your excellent article, “Chestnut optimism survives deadly blight,” which appeared in the Sunday, January 20, 2008 issue of The Charlotte Observer. Thanks for the review of Susan Freinkel’s new book, "American Chestnut: The Life, Death and Rebirth of a Perfect Tree." I purchased a copy a few days ago, will read it, and add it to my collection of books about the American chestnut tree. Another recently published book in my collection is "Mighty Giants: An American Chestnut Anthology," published by The American Chestnut Foundation. Chris Bolgiano is the Editor, and Glenn Novak, the Contributing Editor. Information about the book can be found on the American Chestnut Foundation’s Web site, www.acf.org, and once there, by clicking on the image of the book that appears in the banner. It is inspiring to read about efforts to restore the American chestnut and even more rewarding to help directly with that effort. Members of the Carolinas Chapter of the American Chestnut Foundation, under the direction of the Foundation’s Regional Science Coordinator, Dr. Paul Sisco, help pollinate American chestnut trees to produce hybrid nuts and later help harvest the nuts, store them over winter, and plant them in Chapter orchards in the spring. Members help test the trees for resistance to the chestnut blight to identify those displaying good American chestnut characteristics and good resistance to the chestnut blight so those trees can be backcross pollinated again. Photo albums on the Carolinas Chapter Web site at http://www.carolinas-tacf.org/photographs.php explain many of the processes used in restoring the American chestnut tree. Scroll through the albums to see pictures of members helping pollinate trees, harvesting and planting nuts, and helping test trees for blight resistance. Information about how to join the Carolinas Chapter is found at http://www.carolinas-tacf.org/join.html. Thanks for describing how you reclaimed wormy chestnut planks from an 80-year old barn to make a mantel to place over the wood stove in the cabin you are building. Your account reminded me of the poem by Trumbell Stickney, from “Chestnuts in November,” which appears in the book, Mighty Giants: An American Chestnut Anthology. I, and many others, look forward to future articles in the Charlotte Observer about the American chestnut. 1. Now the GOP could nominate a gubernatorial canidate (Charlotte Mayor Pat McCrory) who is a moderate and has a significant political track record in the state's largest media market. 2. The Mecklenburg Dem Party seems intent on political suicide. First they embarrass themselves by putting up (state Rep. Beverly) Earle as a candidate for mayor and now they keep extending the (Nick) Mackey debacle (as a replacement for former Sheriff Jim Pendergraph). Today, we read Mackey has invited (Rev. Al) Sharpton to Charlotte to make sure the racial polarization on this issue hits 100%. 4. (Rep.) Thomas Wright's refusal to resign keeps the Dem corruption issue alive through the summer. 5. There is a greater than 80% chance that HRC (Hillary Rodham Clinton) will now lead the Dem ticket in the state. 6. There is a small chance that (U.S. Sen. Richard) Burr could be on the national ticket. 7. Neither (state Sen. Ka) Hagan (D-Guilford) nor (Chapel Hill’s Jim) Neal has attracted any national support in the U.S. Senate race and are likely to be outspent by a 4-1 margin by (U.S. Sen. Elizabeth) Dole. 8. The state is likely to be in the midst of a serious recession by this fall which is never good for the incumbent party (at the state or federal levels). Word that the Navy has dropped five controversial sites in North Carolina for consideration of an outlying landing field no doubt has many northeastern N.C. residents relieved. But the Navy is still considering North Carolina by adding two new sites in this state to its list and three more in Virginia. Perhaps the Navy will do its required environmental study with more attention to detail this time, but it is also clear the Navy needs to start talking directly with local residents and figuring out if there is any way under the heavens to persuade local communities to welcome the outlying landing field. If the Navy can’t do that, its efforts probably are doomed on these N.C. sites, too. Well, now. The local citizens didn’t have a lot of money to throw at lawyers. But the Southern Environmental Law Center took up their cause, and so did a team of lawyers from the Charlotte office of Kennedy Covington, which was looking for a pro bono case. And they gave the Navy’s lawyers a thumping in federal court before U.S. District Judge Terrence Boyle ruled the Navy had not done its homework in preparing its environmental impact statement. That was the first big victory by opponents of the OLF – and presaged Monday’s decision by the Navy to start all over again at other sites. Thursday night’s N.C. Republican gubernatorial debate gave voters more to think about now that the GOP race has Charlotte mayor Pat McCrory. I don’t think there was a clear winner or loser; instead, I think the performance of the four probably reinforced impressions potential voters already had of McCrory, state Sen. Fred Smith, Salisbury lawyer Bill Graham and former N.C. Supreme Court Justice Bob Orr, and introduced them to folks who didn't know much about any of them. These boys will have to get a lot more animated before there’s enough reason to call a clear victor, but it was worth watching. Fred Smith’s upside: He was animated, energetic and ready to dominate the discussion. The old Shrine Bowl All-Star football player was ready for action. Fred Smith’s downside: His willingness to prolong the conversation so he could make one more point may have left listeners wishing he’d let the other fellows talk a little more – and did he really mean to suggest he didn’t think the lines of responsibility for schools should be clarified? Bob Orr’s downside: He looked pretty grim at the forum’s outset; a smile and a friendly nod would have helped soften the image of a stern magistrate. Bill Graham’s upside: He was cool, detached, clearly positioning himself as an outsider who thinks the political establishment in Raleigh has fouled things up thoroughly. Bill Graham’s downside: He didn’t have as much to say about the issues as the other three and may have given the impression he wasn’t as well prepared. Pat McCrory’s upside: Relaxed and almost jovial, McCrory smiled some, ticked off the points he wanted to make on specific issues and went out of his way to mention cities around the state that he thinks would benefit from his brand of leadership. Pat McCrory’s downside: He may have come across as the big city pol with all the answers. McCrory does have a lot of answers, but the tightrope he has to walk is avoiding the impression that he has them all. A pause or a recession? Harry Davis is a professor banking at Appalachian State University in Boone and serves as the N.C. Bankers Association’s economist. In an essay sent around Thursday by the association, Davis ponders the data and concludes that we may be in an economic pause rather than a recession. "Hopefully, the national economy is in a pause and not the beginning of a recession. If the Federal Reserve acts aggressively and housing finds a bottom, we may avoid a recession for now or at least set the stage for a short mild recession." Want a copy of what Davis had to say? Send me an email at jbetts@charlotteobserver.com and I'll forward a copy. When Chapel Hill filmmaker John Wilson was working on his new documentary “Senator No: Jesse Helms” that premiered Tuesday on UNC-TV, he scored an interview with Jerry Falwell, founder of the Moral Majority and Liberty University and pastor of Thomas Road Baptist Church in Lynchburg, Va. He got that interview in part because Helms had seen and liked his earlier work, “Dr. Frank,” about the life of the late UNC President Frank Porter Graham, and agreed not only to be interviewed but also to cooperate. That opened doors with many conservatives, Wilson said. After he videotaped Falwell in his office at Liberty University, Wilson said, Falwell gestured at a framed photo in his office and told Wilson, a 1985 graduate of UNC-Chapel Hill, to take a closer look. It was a photograph from the March 18, 1994, NCAA men’s basketball tournament game between Wilson’s Tar Heels and Falwell’s Liberty Flames at Landover, Md. The Tar Heels trailed the Flames 45-46 with 10 minutes left in the game, and the photo in Falwell’s office shows the scoreboard with Liberty leading UNC. The No. 1-ranked Tar Heels went on to win 71-51 behind some key baskets by Rasheed Wallace and Eric Montross even though Jerry Stackhouse had six turnovers and only six points. No doubt the power of prayer helped. 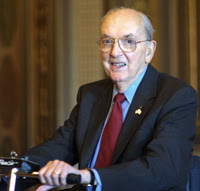 Here’s a don’t-miss program for Tuesday evening TV: “Senator No: Jesse Helms,” airing at 9 p.m. Tuesday on UNC-TV. It’s a 90-minute documentary that tracks Helms from his childhood days in Monroe to the peak of his power in Washington and his late-career turn toward supporting help for AIDS victims in Africa in conjunction with rock star Bono. It’s a fascinating account filled with detail – from recollections by his high school principal and the note that he was ranked most obnoxious in his high school superlatives listing through his disdain for the Civil Rights movement and contempt for social change, his rise to chairman of the Senate Foreign Relations Committee and his close work with the State Department diplomats he once liked to ridicule and excoriate. There are interesting revelations, including some candid comments from former campaign aide Carter Wrenn about the Helms’ campaign’s use of racial appeals to win reelection and insightful comments about his place in American politics from Fred Barnes of the Weekly Standard, UVa political scientist Larry Sabato and the News & Observer’s Rob Christensen. It’s also compelling to see, through still pictures, film and tape, Helms growing from a gawky young man into the powerful, vibrant leader of the New Right and then slowing down as his health and his power began to wane with age. It’s worth watching. Former N.C. Supreme Court Associate Justice Bob Orr – the only candidate in the Republican primary for governor who has won a statewide race – is getting a little impatient with Charlotte Mayor Pat McCrory’s dalliance with the thought of getting into the race for governor. Orr won four statewide races for appellate court judgeships, and though he’s handicapped by not having a ton of money to run on, he’s working hard at it and relying in part on his campaign blog to reach voters. In Orr’s blog today (“More From Orr”, and here’s a link, Orr says McCrory’s coyness is doing himself, and voters in the primary, a disservice. “The unintended impression is simply that this whole exercise is a some kind of a lark and if and when he gets in the race he has nothing to lose and everything to gain...,” Orr writes. “The sense is that old Pat will throw his hat in the ring, make some obligatory appearances at GOP functions, pontificate on being a big city mayor, splash up a million or so in slick TV ads and see if he can win the May primary. If not, no political harm done. In North Carolina politics there’s a presumption that it’s hard for candidates from Mecklenburg County to win statewide races. Hard, but not impossible, as Jim Martin proved in 1984 and 1988 (I know, I know, he had a Lake Norman address, but folks knew where he worked and where he was chairman of the county commissioners before he went to Congress) and as N.C. Supreme Court Chief Justice Sarah Parker of Charlotte proved in the last election. I don’t think there’s a hex on candidates from Mecklenburg. I think every one who lost just was not as good a candidate as those who won the race, for a lot of reasons having to do with political ability, understanding the North Carolina electorate and what appeals to them, and raising the considerable loot to finance their campaigns. Republicans Fred Smith, a state senator from Johnston County, and Bill Graham, a Salisbury lawyer, are also in the GOP race. You can see them as well as the Democratic candidates, Lt. Gov. Beverly Perdue and Treasurer Richard Moore, on UNC TV Thursday night live at 8 p.m. on UNC-NC, the digital channel, and rebroadcast at 10 p.m. on UNC-TV in a forum on the economy for the gubernatorial race. An Observer editorial the other day bemoaned the fact that a defense authorization bill President Bush was vetoing over an unrelated issue included a badly needed ban on the Navy’s using any money to build its proposed outlying landing field in Washington and Beaufort Counties. That site, near the Pocosin Lakes National Wildlife Refuge, would put pilots, planes and large migratory waterfowl at risk. It’s just the wrong place for a practice landing field for aircraft carrier landings. That seems plain enough. This fight is all but over. The only question is whether the Navy will find an alternative site in either Virginia or North Carolina. It’s possible, but local support will be the key. Thanks to former Charlotte lawyer D.G. Martin of Chapel Hill and host of UNC-TV's weekly "NC Bookwatch" program, who found this link on the web that's a 10-page introduction to Bill Link's forthcoming book "Righteous Warrior: Jesse Helms and the Rise of Modern Conservatism." In Martin's weekly column, he writes, "...Link gives a glimpse of Helms' human qualities that sometimes won the admiration even of opponents. Link tells the story of how former senator and star basketball player, Bill Bradley, felt after he shot baskets with Helms' granddaughter, at Helms' request. Watching a "beaming" Helms on the sidelines, Bradley said it was a lesson for him. Link writes that Bradley "found it difficult to regard Helms as 'the personification of evil.' Rather, he saw him as a grandfather, a person, something other than a 'cardboard cutout.'" Martin's "Bookwatch" program airs on Sundays at 5 p.m.
Frank Batten Sr. is one of the smartest people I ever knew, but when word got around nearly three decades ago that he was thinking of developing a full-time cable channel that produced nothing but weather reports, a lot of us who worked for his company wondered if we’d be out of work before long. A pricey gamble on starting up something as outlandish as the Weather Channel might have implications for the morning and evening newspapers in Greensboro, Norfolk and Roanoke. Batten, of course, knew exactly what he was doing: He was creating a worldwide success that would capture the attention of viewers and advertisers, bring in gobs of cash and lead to the development of the lucrative weatherchannel.com Web site. Those ventures were just one reason that Landmark Newspapers remained a highly successful, privately held firm at a time when other newspaper companies were growing faster and attracting public investors. Batten and his successors surely faced lots of challenges running a newspaper business in this market, but they weren’t precisely the same pressures from stockholders that publicly held companies have faced. So when the news broke overnight that Landmark Communications was considering selling off parts of the company, it came as a surprise. It’s no secret that Landmark has been approached before about some of its properties, including the Weather Channel, which some believe could go for $5 billion or more. I worked for years for its newspapers, starting with the Greensboro Daily News, Landmark’s Washington Bureau during the Watergate investigations and later in the Daily News’ Raleigh Bureau and editorial departments. The Greensboro paper produced some giants of journalism: Gerald W. Johnson, Burke Davis, Ed Yoder and Jonathan Yardley among many others. Now Landmark has engaged JPMorgan Chase and Lehman Brothers to help the company consider selling the Weather Channel, the AP reports. The story did not disclose why the company would consider selling any of its parts, but it’s fair to conclude that some family members or private stockholders wanted to cash out rather than stay in the newspaper business now. It’s not the first time and won’t be the last. And who knows? Maybe some of those folks will take the money and develop the next version of the Weather Channel. Jesse Helms won’t be on the ballot this spring, but he’ll be in the news and on the air again. The former U.S. Senator from Raleigh – who reinvented political fund-raising and wedge-issue politics in the 1970s and 80s and helped bring about the Reagan revolution – lives in a nursing home in Raleigh. But he’ll be featured in an upcoming UNC-TV documentary airing Jan. 15. And he’ll be featured in a new biography by former UNC Greensboro historian Bill Link this spring. Sen. Helms was an increasingly influential member of the U.S. Senate for 30 years, winning his first election in 1972 and four subsequent reelections. He served in the Senate longer than any other N.C. senator and, I think, would have won another term if he had run again in 2002, though in recent years he has suffered from vascular dementia. The documentary will air at 9 p.m. on Tuesday, Jan. 15 on UNC-TV. For more information on the program, click here. On Feb. 5, Link’s biography of Helms will be published. It’s called “Righteous Warrior: Jesse Helms and the Rise of Modern Conservatism.” If it’s anywhere near as good as Link’s 1995 biography of former UNC President Bill Friday (“William Friday: Power, Purpose and American Higher Education”), it will be thorough, insightful, detailed and informative. It will be published by St. Martin’s Press. At 656 pages, it will retail for $39.95. Link, by the way, is Richard J. Milbauer Professor of History at the University of Florida.